Mi Casa Hostel, is a small homelly feeling hostel, as traveller I tried to do my best in order that travellers find an home away from home, is a hostel that make easy to meet people and with nice atmosphere and lot of common areas and a kitchen fully equiped. 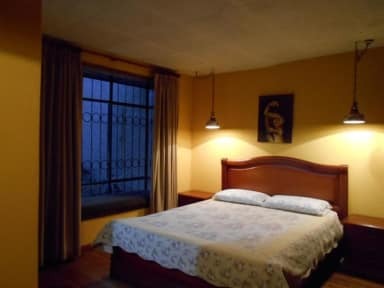 With double private room basic, deluxe with shared or private bathroom and dorms. We are located a walk distance of all main sightseeing, 15 minutes, in a safe neighborhood, where you can find all facilities, like mini markt, bakkery, laundry, fruit shop, restaurants in less than 5 minutes walk distance. To arrive from the bus terminal you can take a taxi that will cost you 2$, will take 5 minutes distance by car or you can take a bus number 8, you have to stop in from the School 3 de Noviembre, the Esteves de Toral is in the corner, you have to walk less that 5 minutes, the cost is 0.25$ or you can walk that will takes 25 minutes. We have available fully equipped kitchen, lounge TV and Covered Garden and WiFi in all the building. The reception is open from 7h30 till 23h. Very nice staff and kitchen was well equipped. Had a very good time here. Very nice and helpful staff. Definitely recommended! This place definitely has to be one of the most comfortable hostels I have spent time in South America. The house really feels like home, the kitchen is fully equipped and the vibe is friendly. Very homey atmosphere with a super friendly staff. It’s beautiful, comfortable and quiet. Felt like home ! Fantastic facilities, very spacious, clean, and comfortable. Thanks for a great stay. La cama muy cómoda y quienes atendían en el hostal amables y dispuestos a ayudar. Los baños limpios, es una casa vieja pero bien conservada. Nice hostel. Has everything you need. Hot water. Good location. Spacious dorm with privacy curtains. Bunk beds are flimsy so you get woken up when the other person moves. 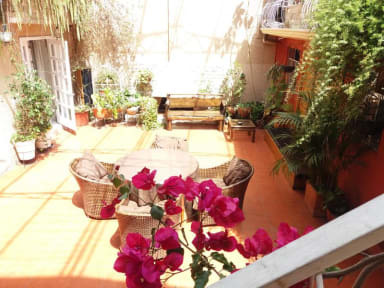 Mi Casa is a cozy, quiet hostel. I stayed in the dorm which was fine but only two bathrooms for a lot of people. It was very clean however, a nice walk to the downtown area and a nice big kitchen and terrace area. A nice hostel but had a bit of a weird vibe at times. Not too far from the city centre and the kitchen and bathrooms were decent. Unfortunately it rained while I was there and there was water running down the wall next to my bed, which caused the wall to partially disintegrate into a paste all over my bag.